Quick Links: OEM Cargo Net install (photos) Blutooth for 07 Tacoma 20 LED strip Best way to black out taillights? Is this all I need to get both wheels in the back turning! Which OEM Wheel Lock To Purchase? Discussion in '2nd Gen. Tacomas (2005-2015)' started by viperstd, Oct 4, 2010. So with all this rain pounding the mid-atlantic, I took the taco out for a spin. It was a short out-and-back. I made it out just fine... it was the back bit that got me. Here are a few crappy cell-phone pics. During the second crossing, The right, front slid off the line and found a nice hole. I love my winch. Unfortunately, I kinked the crap outta my winch line. Time to upgrade to synthetic line! That does not look fun! haha, hope you got it out! I was pulled out w/ my recovery gear re-stowed in under 15 minutes. I really need lockers. Though I'm note sure they would have saved me from getting my feet wet on this one. A fat friend or two standing on the bumper and you would have been golden. When I walked out to the tripoding corner and bounced hard it didn't even wiggle. ...And I am a massive 150 lbs. The front-right was sunk in the mire of middle earth. I'm jealous of all that rain....We haven't had a decent rain for almost two months here in Colorado. What part of maryland are you in? I did something simular when stationed in guam, mud and water up to the door handle. 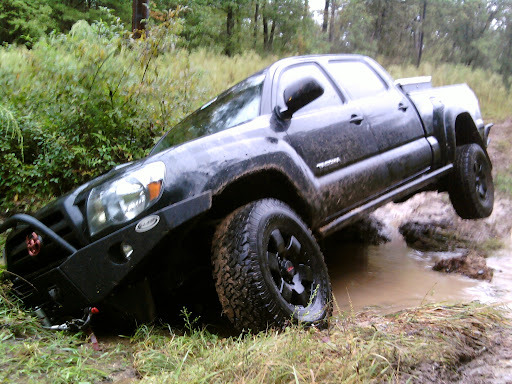 Unfortunitly, i didnt have a winch. 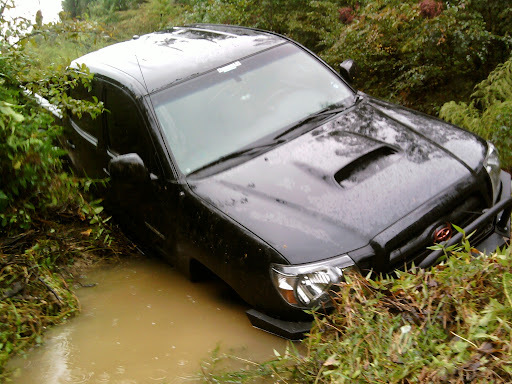 by the time i got pulled out I had muddy water in the cab, fried my amp under the seat, and my computer went under so the truck would not start. had to be towed home. But electronic cleaned the computer and amp, the truck started, the amp didnt. DAM thats a deep hole! Looks like a great time, nice truck by the way. I am in southern MD. St Mary's county. The hole turned out to be a little deeper than I thought! Error 404 not found wtf!? Oh well, who would massage a bear anyway?